Want to learn about tree health, choosing an arborist, planting trees and more? Each year we receive many questions about Garry oak trees, restoration of ecosystems, gardening and much more. We hope these links will get you started - if not, please use our online form to send us a short email by visiting our Contacts page. Trees are often the largest and perhaps most complex living organisms in their respective ecosystems but did you know a tree can actually be thought of as a host for its own unique ecosystem? Trees support other plants, insects, birds and mammals but they also form relationships within their growing area that include bacteria, viruses, fungi and other micro-organisms. Human interaction can easily disrupt this balance causing unseen damage to the tree and its surrounding ecosystem. While the damage may not be immediately noticeable something as simple as adding irrigation or laying a sidewalk could jeopardize your tree and its vital root system. Consulting an arborist is key to ensuring your tree maintains its good health and can also be a factor should you ever have to invoke insurance coverage if your tree should have a problem that causes damage to property or people. Your first step towards hiring an arborist may begin with a visit to your local government. Most have an arborist or tree protection officer on staff who may be able to answer your questions whether the tree is on public or private property. The municipal staff can advise you on local policy, by-laws and provide copies of relevant legislation that will detail your rights and responsibilities. Links to most local governments around Greater Victoria can be found here and if you live in another region consult the web site of your local authority. 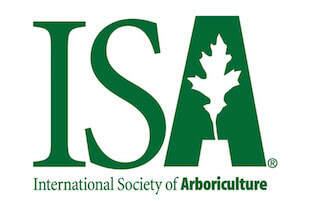 The ISA also maintains a website detailing many aspects of tree ownership, tree care with downloadable content in several languages! Visit their Tree Owner Information site here: https://www.treesaregood.org/treeowner to answer questions regarding the benefits of trees, managing tree hazards and risks, plant health care and so much more. It has been said that anyone can plant a tree, the true challenge is to grow one. The first step in planting a Garry oak is to be certain it is the right tree and the location is correct. There are many factors to consider but most important is whether or not the tree will thrive in the selected location. 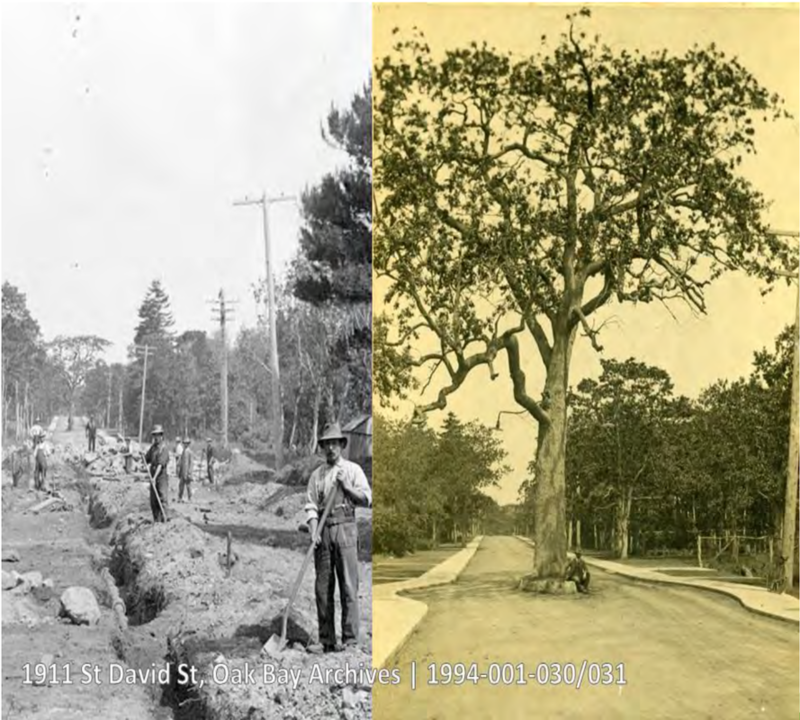 In our urban landscape this can be a difficult process as one must examine current infrastructure but also plan for the future as the Garry oak can be a long lived tree. This image from the Oak Bay Urban Forest Strategy outlines the importance of planning ahead and choosing the right location. To help homeowners in British Columbia choose a planting location it is wise to call BC OneCall to avoid damage to utilities and underground services. Before you finalize your location imagine a large tree growing in it - is it too close to the road, too close to your house? Remember the gardener's motto: Right plant, right place! In the early years after planting a Garry oak seedling protection and a little TLC is needed to help the tree establish itself in the new location. Many will ignore this advice citing the ability of native plants to thrive within our area. There are many factors that complicate this such as composition/structure of urban soils, predators and vandalism but the most important is to realize that a newly transplanted tree needs help to adjust to its new location. When an acorn is allowed to grow it sends down a unique tap root that helps to establish a complex root system from which the tree can grow. A transplanted tree doesn't have that advantage and needs your help! Garry oaks and the many native plants from its unique and threatened ecosystem can be easily incorporated into your existing gardens to add diversity. It simply requires a little planning to match the requirements of the native plants and to locate them in compatible areas of your property. Proper planning and coordination of irrigation can reduce or eliminate any potential damage or negative impacts to your Garry oak's root system - the key to maintaining a healthy tree! Where can you buy native plants to compliment your Garry oak tree? If you search out local garden clubs you may be able to find local sources. Many retail nurseries are now stocking native shrubs as the popularity of Garry oak ecosystems grows both from increased awareness of its threat by development and especially as restoration projects increase. We encourage you to shop local and support your local retailers - if you create that demand those retailers will also reap the benefit of your support. Below are a few links to retailers operating in on Southern Vancouver Island/Gulf Islands and they are presented here for convenience. If you are a retailer specializing in native plants for southern Vancouver island and the Pacific Northwest please send us a note and we may add you to this list. Are you planning to gift a Garry oak seedling to someone? Gifting a seedling is a wonderful thought which can create a legacy for decades, maybe centuries, please realize the responsibility of initial tree care. If you choose to gift a tree please work with the recipient to ensure the seedling receives that special TLC in its first few years. Are you thinking about restoring a Garry oak meadow? We receive many questions from homeowners, teachers and neighbours who just want to help save the Garry oak trees. The first and foremost aspect to consider is, "Who owns the lands?" Please respect the rights of landowners and always seek permission and before any action is taken. Cooperation will go far! Before land can be restored it must be protected and those who use it must be educated. These principles are the cornerstone to ensuring a successful project and in some cases they may be more important than the restoration work. If you are interested in speaking with professionals who can advise you further we can provide you with referrals to experts in Greater Victoria. Restoration on public property requires permission and support from the agency, government or authority that is responsible for the land. Local governments may not have the financial resources to enable restoration but they may have options for volunteers to help out. One of the best examples is the Pulling Together Volunteer Program of Saanich, BC. Another important consideration before working on public land is knowing the landowner's intent. Municipal local area plans will detail the direction the community has chosen to go and other agencies like school boards will have policies outlining land use. Some lands may not be ideal if they are slated asset disposal (sale) or if the agency lacks the resources to manage them in the years to come. Attending public meetings for local government, school boards and especially consulting your local neighbourhood association will prove invaluable. Do you want to learn more about Garry Oak Ecosystems and meadows? These links to PDF documents and other websites will get you started and we also encourage you to join your local Natural History Society or seek out gardening clubs with a focus on Native Plants!